Looking for cold Guinness, a good pour of Jameson, and service with a smile? Swing by these Austin pubs for just that, and more! With sports-heavy atmospheres and bar food to make you swoon, you’ll never be bored rotating through these local pub picks. A great spot downtown to grab a pint of the black stuff. People from all walks of life go to BD Riley’s and are treated like family. This is a dandy little spot on Dirty Sixth (and soon to add a Mueller location) that will keep you comfortable in its historic walls. BD’s classic “Black n Tan” and reuben sandwich are must orders. Notably known as a Notre Dame, University of Texas, and NFL Patriots watering hole, cheers to another fun Irish pub. Black Sheep Lodge is your go-to large-scale sports watch party venue. Equipped with pool tables, shuffleboard, and a patio, this South Lamar spot is hot. Not to mention, drink specials all day, every single day and free wifi perfect for folks multi-tasking with work and play. The wings are massive and the beer selection is vast. You really can’t go wrong with this lodge. Happy #NationalIPADay! We're celebrating this brilliant holiday with $1 off @512brewing SMaSH Caliente, @hopsandgrain Pale Mosaic, @friendsandalliesbrewing Noisy Cricket, @thirstyplanetbrewery Bucket Head, and @lonepint Yellow Rose! Buy the beer, keep the awesome pint glass! ??? Long, communal tables fill the room and are perfect for large groups and sports fans. Haymaker has become English Premiere League central these days with the Chelsea, Manchester City, Everton, Aston Villa and West Ham fans calling it home. Though known as a TV-lined saloon specializing in sandwiches, you should definitely dine on the poutine. We're bringing Italy to Austin with this week's food special! Come try our Chicken Parmesan Sandwich! $1 off pints, $2 off whiskey, and FOOTBALL SQUARES FOR THE BIG GAME! See everyone soon! This place has that great, pub-style feel with plenty of craft on tap. Step outside for picnic table seating, rope lighting, and on-site food trucks. Their best kept secret? On Saturdays, around 5 p.m., Draught House Pub and Brewery serves free bratwursts to all customers. Welcome to your new central-Austin oasis of good times! Jack and Gingers goes to great lengths to provide an Irish atmosphere. This place is a gem, though a bit of a drive, but whether you’re looking to hang out with a bunch of friends or sit back and watch a sports game with a pitcher, this place is for you. A hidden joint on the East side, Dog and Duck serves up Scottish eggs and good times, not to mention happy hour every weekday from 3 p.m. – 7 p.m. Order drinks and food at the bar in this casually comfortable setting. The Dog and Duck Pub is best enjoyed when you have nowhere to be. Check out the huge selection of micro brew and Guinness beer to wash down the fried mushrooms. With a hip, social vibe and knowledgeable staff near UT’s campus, Hopfields’ beer selection is just extensive enough to be impressive to a beer snob but not too overwhelming to the beginners. It’s got a great combination of local favorites and show-stoppers from across the country. Be sure to make a reservation if you’re dining in, and don’t skip out on the Pascal Burger. The atmosphere here is charming, cool, rustic, and laid back — perfect for brews and burgers. This slightly more upscale pub sits on South Lamar. You won’t find any TVs here, but the people watching is prime and the parked local, lobster food truck will keep you well fed. Gibson Street is friendly and laid back, and the decor is warm and inviting. You’ll want to stay all day, we promise. Drop in for a proper pour at Fado, the Warehouse District’s intimate Irish bar. If you are into soccer or rugby this is definitely your spot, and Fado goes out of their way to make sure every match is on for every fan. Snack on Guinness cheese bread and fish and chips in this stained glass, multi-platform pub. With Happy Hour deals every weekday from 4 p.m. – 7 p.m., it’s an overall great spot to go to get your Irish on. What a great place to spend happy hour in downtown Austin! Austin Ale’s pub atmosphere is scattered with local art and ideal for Thursday night football. Try the nachos and watermelon slaw, and no ounce of you will be disappointed. They even have kombucha on tap! 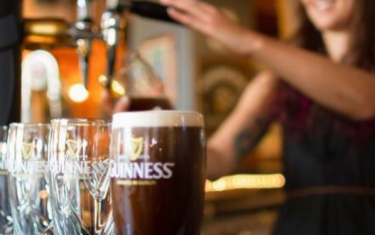 With St. Patrick’s Day right around the corner, you’ll definitely want to familiarize yourself with these Austin Pubs that pair smart and tasty menus with your drinks. Don’t see your favorite spot? Comment below and let us know your favorite place to eat and drink the night away!